The facade (and interior) of Frank Milorey's newsstand at 12th and Market Streets in Center City is covered with comic books. 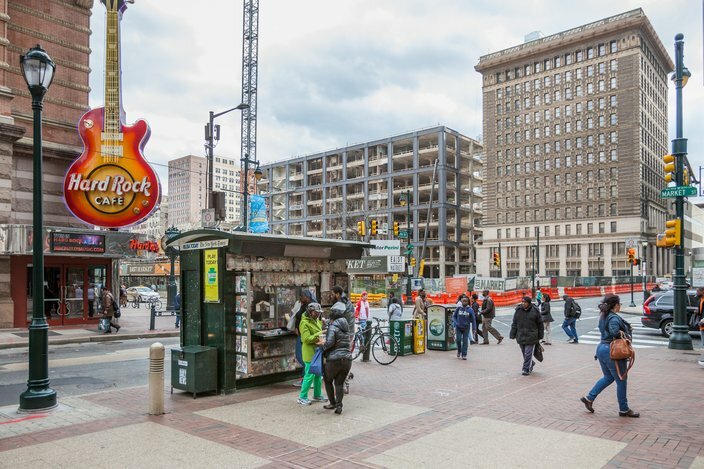 The newsstands that dot Center City Philadelphia are largely unremarkable, blending into the streetscape until the wandering pedestrian develops a hankering for lottery tickets or a pack of gum. As print media continues to struggle, most newsstands don’t sell many newspapers or magazines anymore, leaving their exteriors unadorned and transformed into dreary little pill boxes. There are a couple of notable exceptions though, at 11th and Chestnut and 12th and Market, where twin brothers have staked their newsstands and covered them with comic books. All the Marvel and D.C. greats are there, Batman, the X-Men, even titles that were rescued from obscurity by the movie studios, like Guardians of the Galaxy. 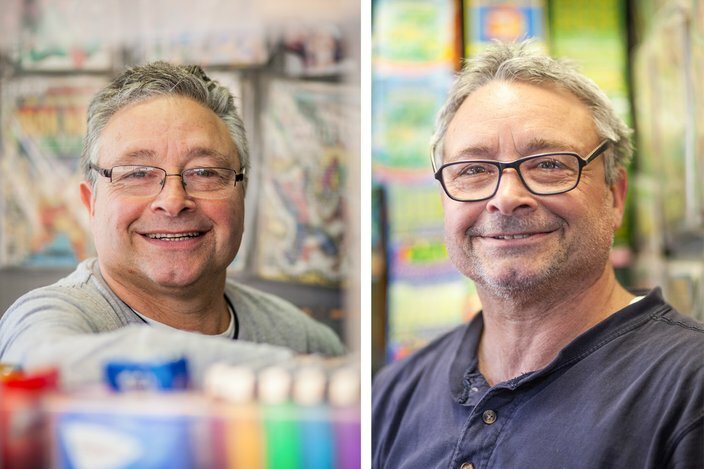 Frank and his identical twin brother, Lou Milorey, who has owned and operated the stand at 11th and Chestnut since 1985, were born in 1953 in South Philadelphia. Their childhood love of comics waxed and waned, but today both of their newsstands are resplendent in the multi-colored hues of the two major superhero universes. The brothers no longer buy new issues, but they go to all the new comic-derived blockbuster movies together. Frank stopped collecting comics in the 1970s when he felt too many new characters were being introduced, started buying again in 1993 after being lured back in by the “Death of Superman” arc, and stopped again when his now ex-wife took issue with the amount of money being funneled into funny books. But during that window when he collected again in his 40s, Frank did so with an eye toward selling the comics out of his brother’s newsstand. After amassing a collection of well over 15,000 issues, he retired from his old accounting job at the Navy Yard and acquired a newsstand of his own. Now both brothers sell the collection, which is down to about 10,000. Identical twin brothers Lou Milorey, left, and Frank Milorey own Center City newsstands. Lou has owned and operated the stand at 11th and Chestnut since 1985. Frank has owned and operated a stand at 12th and Market streets since 1998. But the trappings of their tiny businesses are sunnier than the outlook for the newsstand industry – which both men believe is bleak – or of the general economy and the future of America, which both men believe is bleaker still. The proliferation of lottery sellers has devastated the newsstand business, which historically received the majority of its profits from the state-sponsored enterprise since its introduction in the 1970s. But Lou’s grim prognosis of the newsstand business colors his perspective of the larger economy, too. Both brothers note that the city's $2 tax on cigarettes blew apart that part of their business. The lottery was and remains the biggest contributor to their bottom lines, a fact that is evident from just a few minutes loitering around their boxes. A steady stream of customers sidles up, almost all of them buying the lotto. The comics don’t sell too briskly. Lou says he hasn’t sold one in three weeks from his stand, which lies in the shadow of the Thomas Jefferson University Hospital and across the street from Milk Boy. His brother’s stand sells comics more steadily, perhaps because his business is next to the Marriott hotel, the Pennsylvania Convention Center and Reading Terminal Market – there's a lot more tourist dollars floating around. Frank also just seems more devoted to hawking the comic collection — although he says days can go by where he doesn’t part company with a single book. Frank Milorey's newsstand, across from the Hard Rock Cafe, at 12th and Market Streets in Center City. 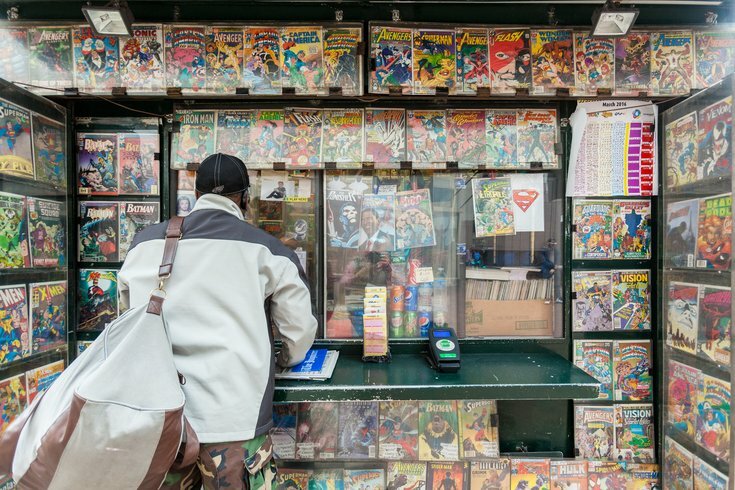 After amassing a collection of of more than 15,000 comic books, Milorey retired from his accounting job at the Navy Yard and bought his own newsstand. Now he and his twin brother, Lou, are selling off the collection at their newsstands. The newsstand business wasn’t always such an iffy prospect. Lou, in particular, remembers his decision to get into the business fondly. He worked for seven years in the accounting department at the Navy Yard — back when it was actually still run by the Navy — and grew jaded during the period of Reagan-era cutbacks and sub-contracting. But one evening as he moped about his job, a friend told him about a newsstand for sale. Lou jumped at the chance – he’d always wanted a more social job. It cost him $50,000 in 1985 (more than $112,000 today). Despite their recent struggles, the newsstand business, and to a lesser extent the selling of comic books, has served the brothers well. They’ve lived in South Philly all their lives, but have moved up from the narrow confines of their childhood home on Mercy Street, lined with two story brick row houses and cars parked half on the sidewalk. Today they live two doors away from each other, separated only by a house owned by a childhood friend, in the far southwestern corner of South Philly. Their neighborhood in the suburban-style development on Reserve Drive, where the naval quarters used to be, looks like something out of South Jersey. The houses have lawns, driveways and about four times the frontage of an old school South Philly rowhome. But despite their success the brothers are not sanguine about the future of their industry, the comic book business, or the country. Frank worries about his son, who hasn’t been able to find a job these past two years, and his grandson, who is as obsessed with comic books as his grandfather. The brothers both express interest in Donald Trump as the candidate most likely to radically alter the American political economy. If that doesn’t work, then the revolution. But for now, they’ll have to settle for Marvel Studio’s "Civil War," out May 6. They plan on seeing it together, and then placing Captain America comics prominently on their newsstands.